...by giving a Journal Jar. 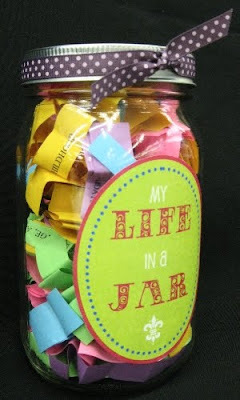 This jar includes over 100 questions and topics to write about. Wouldn't it be nice to have your moms life story all written out by the end of the year? This year for Mother's Day, ask her to write her story for you by giving her a Journal Jar. Then, when it's finished... you can copy it all in her handwriting, or you can retype it and give it to everyone in your family for Christmas. (That's two birds with one stone!) Call and order your today... they are going fast!